In order to avoid corrosion, continuous and error-free corrosion protection is a critical factor in the painting process. As the thickness of the applied painting on burrs can only be determined under challenging limitations, it is a decisive advantage when the burrs are recognised early in the production process before the corrosion protection and other paint layers are applied. In contrast to fixed solutions that enable a random test, Micro-Epsilon offers its scanCONTROL 2910-10/BL Plug & Play system which provides the required precision with its high point resolution of approx. 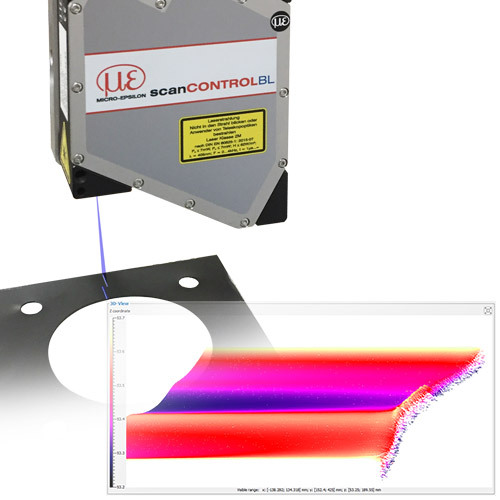 8µm along the laser line in order to recognise burrs reliably even during inline measurements.